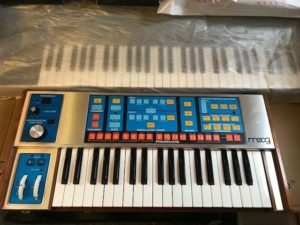 “Moog The Source Analog Synth Synthesizer Big, Fat, Moag Sound, I hesitate to sell it. Normal signs of wear on the edges. Overall, Very good condition. This Source operates so nice, fresh and reactive, springy and alive. 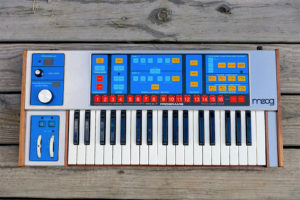 -Purchased in the early 80′. 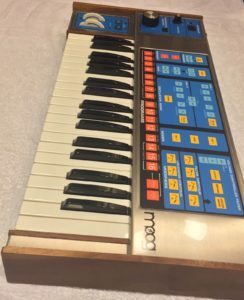 “I purchased this early 80’s Moog in 1999. 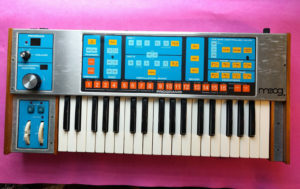 Good working condition with photocopied user manual, kept in same studio. Converted to take UK mains plug. 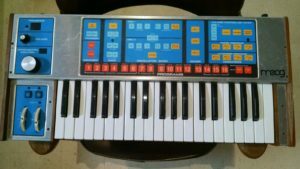 This synthesizer has very solid lead sounds and with filter and modulation the Source can make some very impressive sounds. Excellent bass and sub bass tones that are perfect. 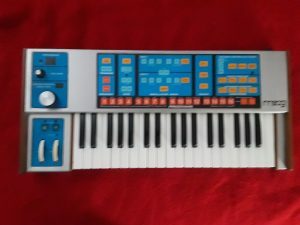 This can be MIDI controlled using CV gates and Kenton Pro Midi controller (or any other interface) which I’m auctioning separately. 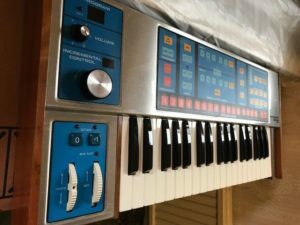 “Up for sale, a 1980’s Moog Source vintage analog synthesizer in excellent condition and in perfect working order. 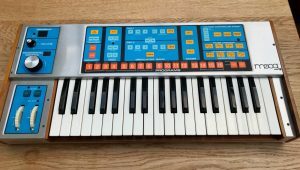 Complete with a brand new secondary membrane control panel, LeCover dust cover, additional padded cover, and original manual, this vintage synth is a well-kept example of Moog’s first programmable model. 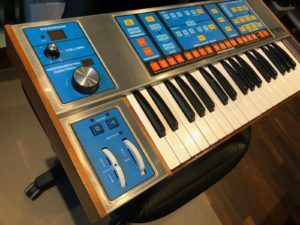 With additional MIDI In and Thru upgrades, the flexibility of this keyboard is greatly increased, and the two classic MiniMoog analog oscillators and 24 dB filter sound incredibly fat and rich. Moog’s Source was their first to offer patch memory storage, with 16 memory locations to instantly recall your synth patches. A cassette-tape jack was also implemented to transfer your patches to and from an external tape and free up the on-board memory for additional new patches. Unlike previous Moog models, all parameters are controlled by a single data wheel. Just select your desired patch or parameter on the membrane pad and use the wheel to assign a value from 1-100. 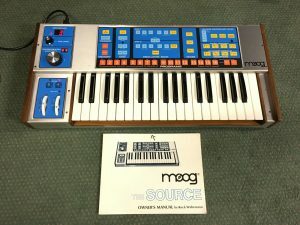 Straightforward and easy to use, the Source allows for a variety of distinct Moog sounds to be selected on the fly and additional tweaking can be done in real time too. 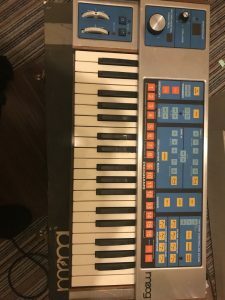 “Moog Source Rare Vintage Analog Synthesizer with MIDI (Encore) ! Has been professionally serviced and tuned. Encore MIDI has been installed. The item have signs of cosmetic wear, but is fully operational and functions as intended. Check out the pictures to make sure you like it. “Keyboard is in really good shape. Very playable. Serviced around a year ago. 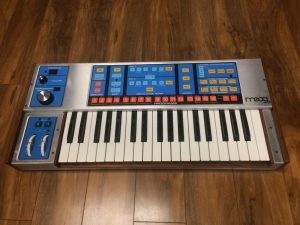 All functions buttons, keys, knobs, etc…. working as they should. Sounds amazing!!! 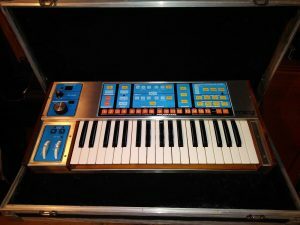 “The infamous Moog “The Source.” A classic, rare one of a kind piece used in thousands of pop songs through the decades. “The best priced Source on eBay in nice condition (please see pics). I have seen some scruffy ones cheaper but this one is decent. Priced for quick sale! 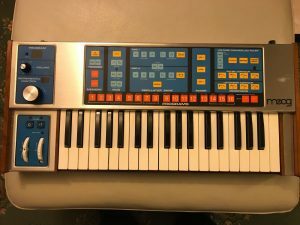 Just bought a Moog Voyager Xl so I have to let this one go. Keyboard is in really good shape. Very playable. Serviced around a year ago. 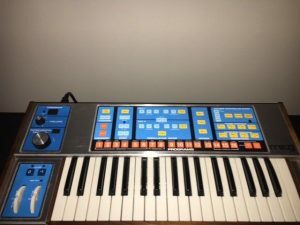 All functions buttons, keys, knobs, etc…. working as they should. Sounds amazing!!! Played by New Order, Devo, a true BASS monster…radical!! 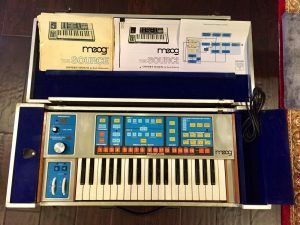 “The Moog Source from 1981.If you are reading this you will know what it’s all about. 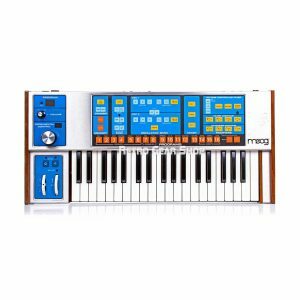 ” Moog Source is a highly sought after, goto synth for EDM, Hip Hop, FX R&B Funk and more! 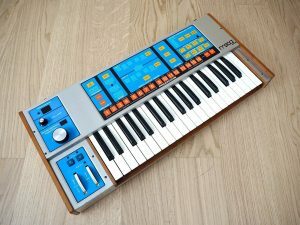 If you are into synths, this is a must have! However this unit is not working. It powers on and indicates the rate, but it does not generate sound. I think oscillators need to be reinitialized, but I am no Moog expert. It does have new battery and contacts were cleaned. If you get it working the online manuals show how to reprogram presets as well as new presets. 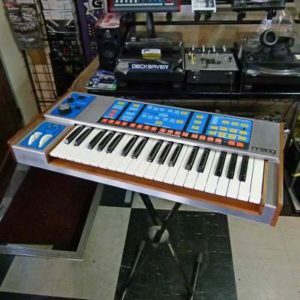 “Here is a vintage 1980’s Moog The Source synthesizer keyboard. 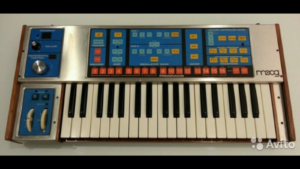 The first Moog that offered patch memory storage and cassette tape transfer. Very easy to dial in sounds and then save them to the internal memory. A great addition to any studio. Sounds great! Super warm and fat analog tones.